Every person who works at Baas Framing Studio is an artisan who brings skill, care and creativity to the job. To us, each piece of art is a unique opportunity to design a lasting presentation that clients will enjoy for years to come. Our commitment to archival materials, proper mounting options and UV protection for items of lasting significance means we deliver the best quality framing product. We are celebrating our 22nd year in business. 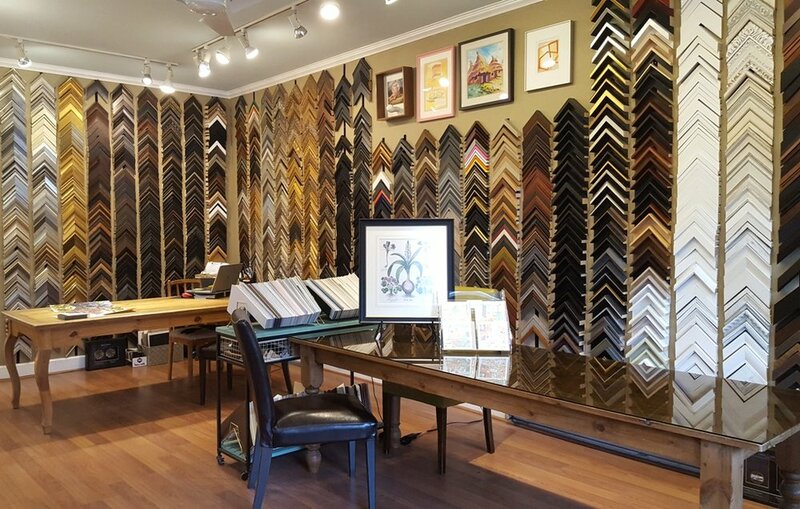 Clients new and old come to our Madison Valley location for our large frame selection, experienced staff, and clear design and conservation knowledge. When you come to us, you will get friendly service, clear advice and estimates and a beautiful finished product. Karrie Baas opened Baas Framing Art Gallery and Framing in 1995. A graduate of Cornish College of the Arts, Karrie is a painter, sculptor and creative visual thinker who loves the design challenges of framing. Her passion for art and artists shaped the business. Karrie was President of the Alumni Association and served on the Cornish Board of Trustees. She continues to support students and alumni with their framing needs. Karrie is a longtime member of the GSBA and was also honored with the Mayor's Small Business Award in 2007. Read a recent profile of Karrie in the Madison Valley News. From 1994 - 2009, Baas Art Gallery presented solo and group shows of Northwest artists including Fulgencio Lazo, Ellen Rutledge, the late Eugene Pizzuto and Pat Clayton. We continue to feature Northwest artists, jewelers and craftspeople in a retail environment, and value our ongoing relationships with artists and our community. We support a number of local school auctions and charities every year and are a member of the Madison Valley Business Association. Peter Keller joined Baas Framing Studio in 2013. A graduate of Columbus College of Art, Peter has 22 years of picture framing experience. His skills include problem-solving unusual projects and building stacked frames. When he's not working here, you can find Peter creating sonic experiences as a sound artist, performer and DJ. From among his many projects, check out audio clips of Kōan-Din (meditative feedback) and Dosenöffner (analog synth collaboration). Julia Ricketts has been with Baas Framing Studio since 1996 and is pleased to celebrate 20 years of framing and fun with Karrie. Julia loves designing framing for original art of all kinds. She likes achieving elegant design solutions that work with both the artwork and the customer's taste, budget and decor. Julia's special skills include canvas stretching and painting touch-up and repair. She is a painter and teaches both painting and drawing at the Gage Academy of Art. View Julia's website. Heather Wehman joined Baas Framing Studio in 2015. A Madison Park local, Heather enjoys her short commute and helping our neighbors with their framing needs. Heather has 17 years of picture framing experience and a background in graphic design and advertising. Heather's often assists customers in selecting their framing to best match the aesthetic of the artwork and decor. When she's not assembling projects, she's sure to be outdoors hiking, kayaking or swimming.